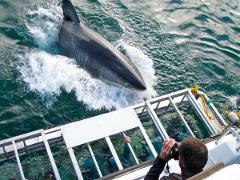 Shark & Safari provides shark cage diving tours from Simonstown Falsebay, 45min drive from Cape Town. Shark diving occurs around Seal Island which is just off the coast and is home to one of the largest seal colonies in Southern Africa. Seal Island is a small land mass(2.0 hectares) located 5.7 kilometres off the northern beaches of False Bay, near Cape Town, in South Africa. The island is so named because of the great number of Cape fur seals that occupy it. The approximately 64 000 seals provide the main diet of the Great White Shark. Our biggest boat only takes 18 clients. Light snacks and refreshments are served on the boat. Morning dives generally have more sightings than the afternoon.